[ John Bertram Askew, socialist writer and associate of Engels, Trotsky and Lenin. ] Two long parts of Autograph Letters, one signed 'J. B. Askew', on topics including the state of Russia, August Bebel, Karl Kautsky, SDP Congress in Breslau 1895. The two parts, apparently from different letters, are both on bifoliums: the first, numbered '2', is 4pp., 12mo; the second, numbered '5', is 4pp., 16mo. In good condition, lightly aged. 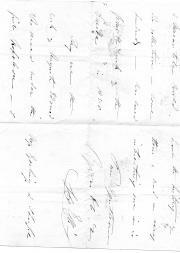 The second bifolium signed at end: 'Best Wishes to Mrs C. | Yrs | J B. Askew'. Written in a neat if somewhat eccentric hand. The first bifolium begins: '[…] is very sore. Nothing will be done at the Congress except Bebel [August Bebel (1840-1913), German socialist] will speak and move a resolution to the effect that the Party stands by its present program and tactics. [ Baron August von Cetto, Bavarian diplomat. ] Autograph Signature ('Cetto'). On 1.5 x 5 cm strip of paper. In fair condition, lightly aged. Cut from letter. [ 'The Dirigible Balloon' game. ] Printed instructions, in French, for 'un nouveau jeu instructif' titled 'Le Ballon Dirigeable', with reference to 'le comte Zeppelin', 'Santos Dumont', the 'Freres Wright' and the 'major de Parseval'. French. Unattributed and undated (pre-First World War?). 1p., 8vo. On cheap paper stock. Aged, and with chipping and closed tears to extremities. Stamped on the reverse by the Paris bookseller C. F. Labarre (fl. 1970). Printed in the bottom left-hand corner: 'No. 6012.' 37 lines of text. Typed Letter Signed ('Aug. Dietz'), with Autograph postscript, from the American philatelist August Dietz to Henry M. W. Eastman of Roslyn, NY, regarding a work he is preparing on Confederate stamps. On letterhead of The Dietz Printing Company, Richmond, Virginia. 30 August 1919. 2pp., 8vo. Good, on lightly-aged blue paper with brown border, with slight chipping to one corner. Eastman has purchased a 'Set of Fac-Simile Die-Proofs with the Autographed Card'. Presuming that Eastman is 'interested in Confederates', Dietz is enclosing 'the tentative Foreword' to 'a far more "pretentious" work - one upon which I have been engaged for many years': 'It "promises" to make over 400 pages octavo, and I am not yet through the Manuscript. 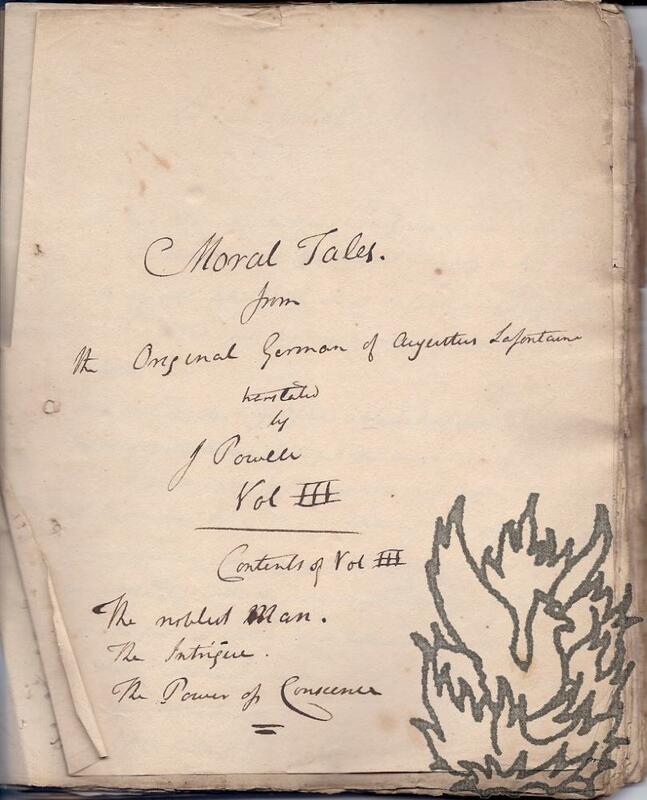 English manuscript translations of three 'Moral Tales from the Original German of Augustus Lafontaine translated by J Powell [James Powell of the Custom House)] Vol III', titled 'The noblest Man', 'The Intrigue' and 'The Power of Conscience'. Circa 1804 (date of watermark). London? 4to, 134 pp. 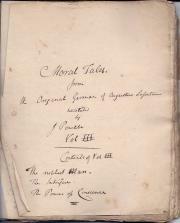 In original loose grey wraps, with 'Moral Tales | Vol III' in manuscript on front. Texts clear and complete, with numerous manuscript emendations. Fair, on aged paper, with slight creasing to corners of a few leaves. Wraps worn. Comprising 34 bifoliums (watermarked 'RW | KENT'), with a single leaf (watermarked 'TW | 1804') carrying the title 'Moral Tales. | from | the Original German of Augustus Lafontaine | translated | by | J Powell | Vol III | Contents of Vol III | The noblest Man. | The Intrigue | The Power of Conscience'. Dimensions 14 centimeters by 9 centimeters. In good condition, although grubby and with creasing to one corner and ink from postmark along one edge. Sepia photograph of airborne balloon with a tangle of guyropes and mass of people beneath it. Hangars in background. The airship pioneer August von Parseval (1861-1942) worked in partnership with the engineer Hans Bartsch von Sigsfeld and the businessman August Riedinge. The "Dragonballoons" (Drachenballone), which he designed for military observation, are predecessors of the present-day blimp. London: George Newnes, Ltd. July 1896. 8vo: xxiv + 120 + viii pp. In original blue printed wraps. Good, in grubby, lightly worn wraps. Thumbprint in margin of one page. Numerous illustrated advertisements at front and rear. Front wrap headed 'TO THE NORTH POLE BY BALLOON! Special Interview with Mr. Andrée.' Many illustrations. Story's piece on Andrée's balloon voyage covers fifteen pages (77-91) and features 25 illustrations and diagrams. Among the other contributions are an installment of Conan Doyle's 'Rodney Stone' and an early illustrated article on X-ray photography, 'The New Photography' by Alfred W. Porter. Autograph Letter Signed ('Geo Ellis') to Messrs Gosling & Sharpe, London bankers. 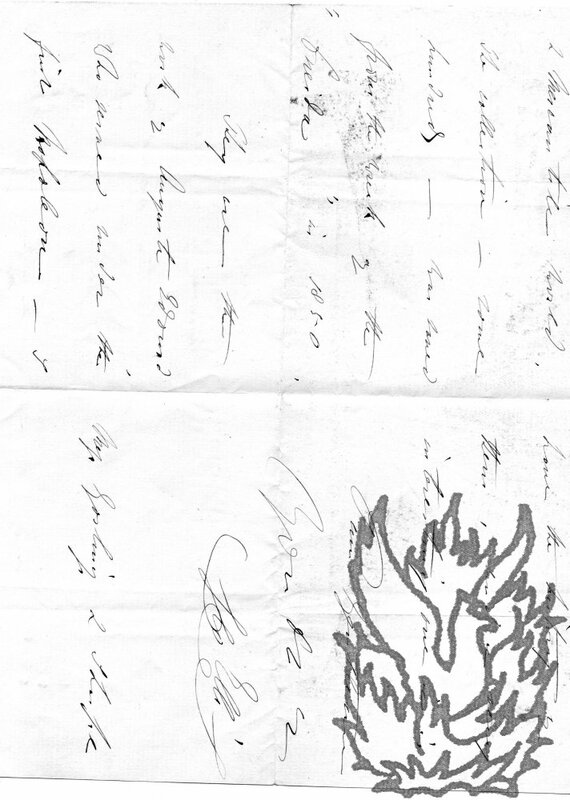 4 September 1878; on letterhead of 10 Bolton Road, St John's Wood. 12mo bifolium: 3 pp. Good on slightly grubby paper. He wishes to be informed 'which branch of the family the enclosed represent'. 'They are part of a large collection of persons connected with the Stock Exchange & mercantile world. The collection - some hundreds - was saved from the wreck of the "Oneida" in 1850', and is the work of August Edouard, 'who served under the first Napoleon'. He has 'the history of them, and a very interesting one it is'. 1804. Berlin bei F. T. de La Garde. 12mo (leaf and plate dimensions 115 x 80 mm): [ii] + 247 pp + 6 hand-coloured engravings. Good, on lightly aged and spotted paper, in heavily worn original boards, with ink stain on back board. The plays included are:  Das Urtheil des Paris;  Die Tochter Pharaonis;  Ruebezahl;  Incognito;  Die Uhr und die Mandeltorte;  Sultan Bimbambum. Engraved title and six whimsical hand-coloured engravings by Mueller from the designs of the Frankfurt artist G. M.
29 September 1891; on letterhead 'London County Council. | Spring Gardens, S.W.' with the Council's 1889 oval crest.